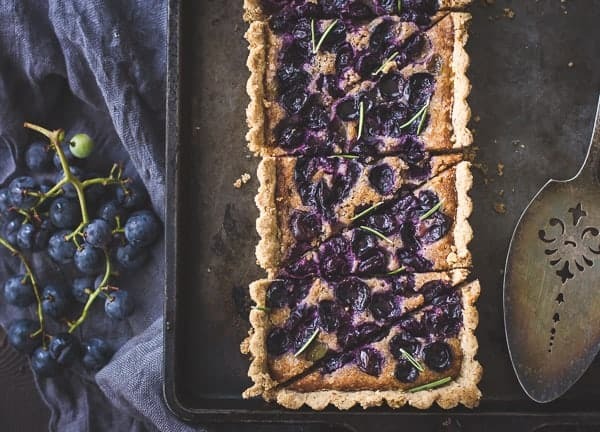 This concord grape tart recipe starts with a press-in, gluten-free crust that’s kissed with walnuts and rosemary and tastes like a shortbread cookie. It’s then topped with a walnut frangipane and halved and pitted concord grapes. I thought of Danese while making this tart the other day, though my mantra was slightly different. A friend had given me about 20 pounds of home-grown concord grapes and I needed a way to get through them all. 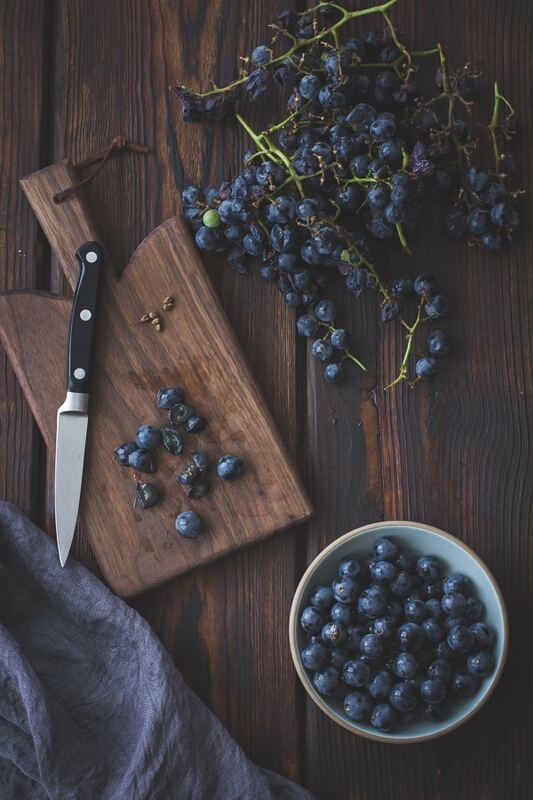 Concord grapes are an old-school variety, with skins that slip easily off their flesh, three fat seeds tucked inside, and a big, sweet flavor that lets you know where the inspiration for grape-flavored candies came from. 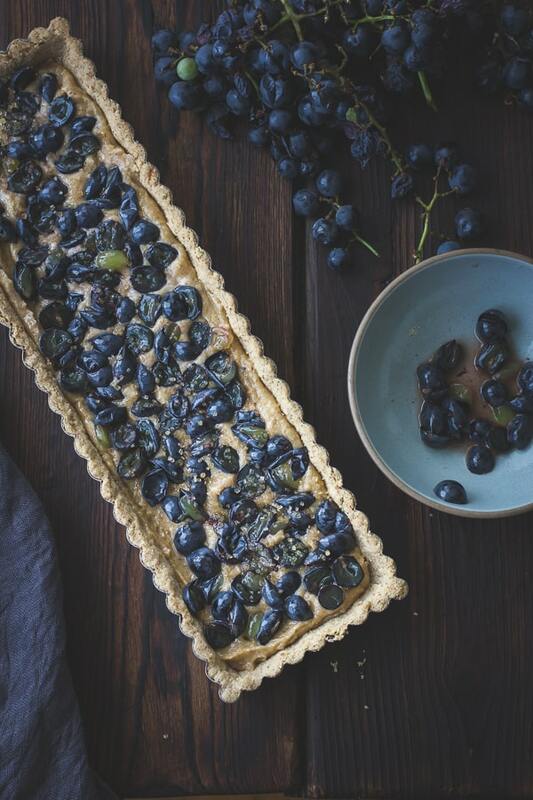 Since the grapes themselves contain a ton of natural sweetness, I like them paired with contrasting flavors: salty, bitter, and savory, so I decided to bake them into a smear of walnut frangipane nestled in a rosemary-kissed crust. 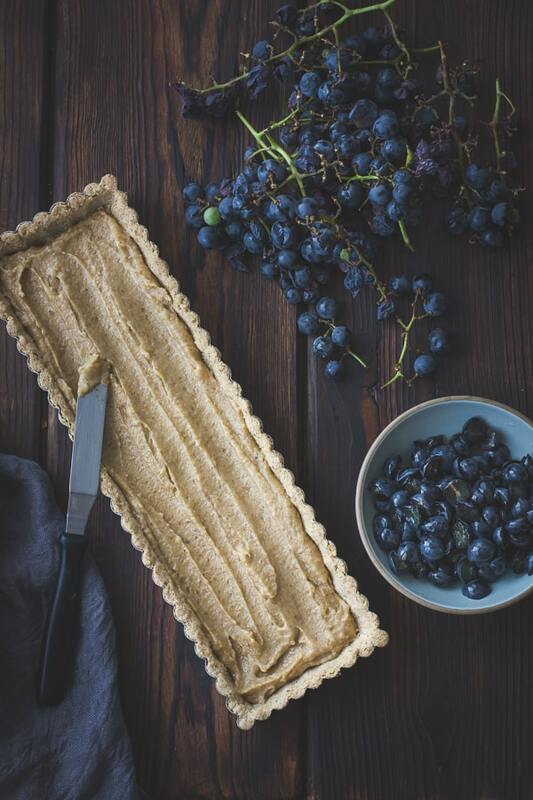 For my first try, I pressed whole grapes into the frangipane. I knew this would leave their hefty seeds in tact, but wouldn’t it be lovely if the simplest method could work? Sadly, this was not the case. The hard, bitter seeds made the tart-eating experience wholly unpleasant; they would have to go. The last time I pitted concord grapes, I was working at an upscale new restaurant in San Francisco as a pastry cook and plater. Plating was the most miserable job there because one was abandoned by the prep crew to deal with (and be held responsible for) all their foibles of the day. Tiny tarts with crusts so delicate that they disintegrated into oblivion as they were unmolded. Crème brulée that had to be frozen for exactly 5 minutes, then turned out onto plates, torched, and served at the exact second before it melted into a puddle. Napoleons with ice cream as their base layer that were assembled to order as servers tapped their feet impatiently, glaring at you for taking so long. Ten hours of this without a break and nothing to eat save for the occasional, surreptitious spoonful of ice cream left me understanding why cooks are notorious alcoholics. 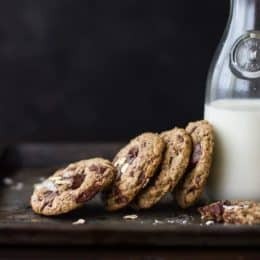 It was while alone in the pastry station, plucking seeds from grapes the size of a fingertip as order after order piled up, that I truly knew misery. I thought back to that wretched job the other day as I stood in my kitchen, seeding grapes. It was only a cup or so of grapes, and the task wasn’t difficult when in the comfort of one’s own kitchen with good tunes playing on Spotify and no aggro waiters glaring at me. Under these circumstances, I normally don’t mind a bit of tedium. The whole thing probably only took 10 minutes. But I was coming down with a cold that made me want to crawl under the covers and watch Jason Bateman films all day long. Thankfully after all that drama, the tart turned out beautifully. 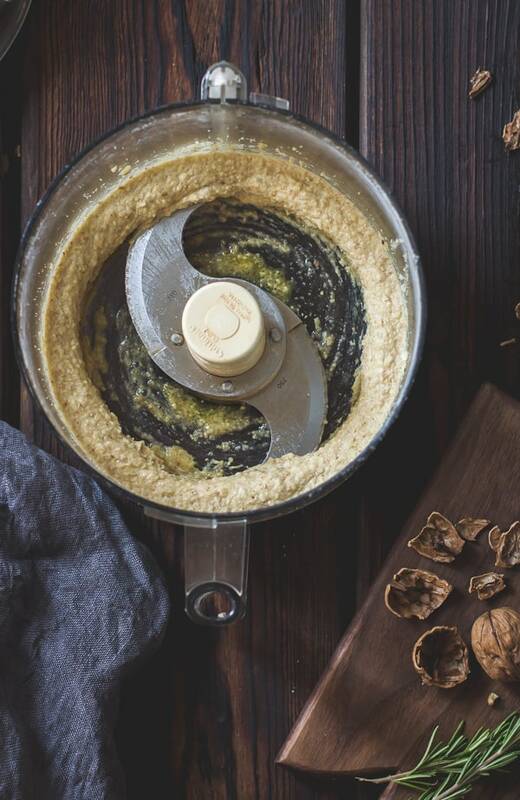 The crust and frangipane both come together in the food processor in a matter of minutes. In the oven, the grapes cook into little puddles of intensely flavored jam. The frangipane puffs up into custardy bliss, and the crust stays together enough to slice, crumbling beneath the pressure of a fork into buttery, salted deliciousness. 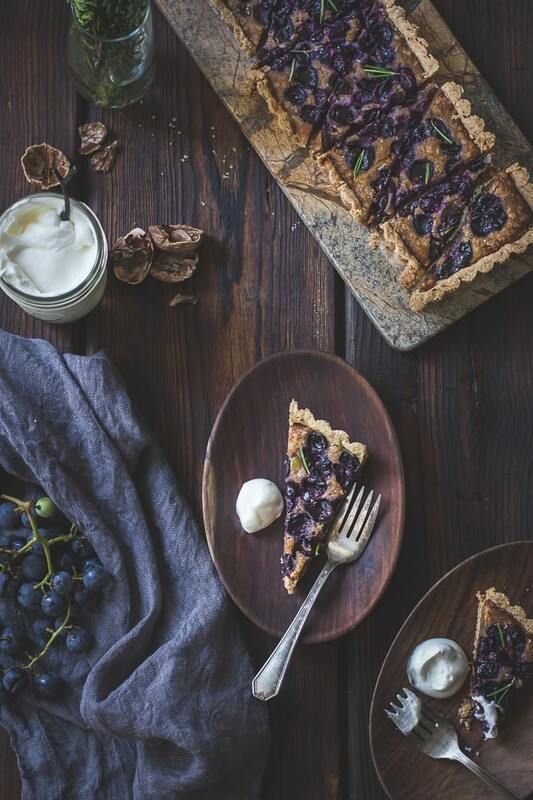 This is a versatile tart and fragipane duo that could work with any number of fruits if Concord grapes aren’t available, such as sliced plums, blackberries, ripe pear slices, poached quince, quartered figs, or seedless red or purple table grapes. Sweet rice flour (Mochiko) is stickier than regular rice flour and can be found in Asian markets (sometimes called glutinous rice flour, though it doesn’t contain wheat gluten). 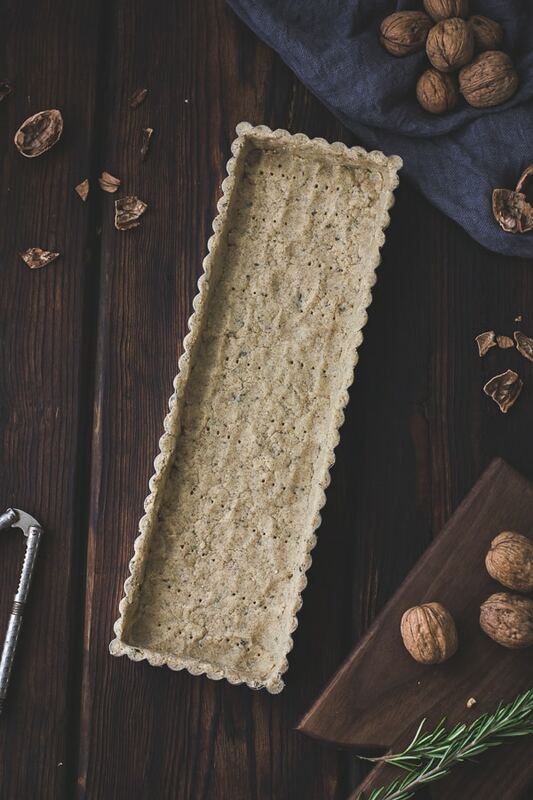 If you only have regular rice flour, you may want to add 1/4-1/2 teaspoon xanthan gum, or a tablespoon of ground chia or flax seed, to help the crust hold together. 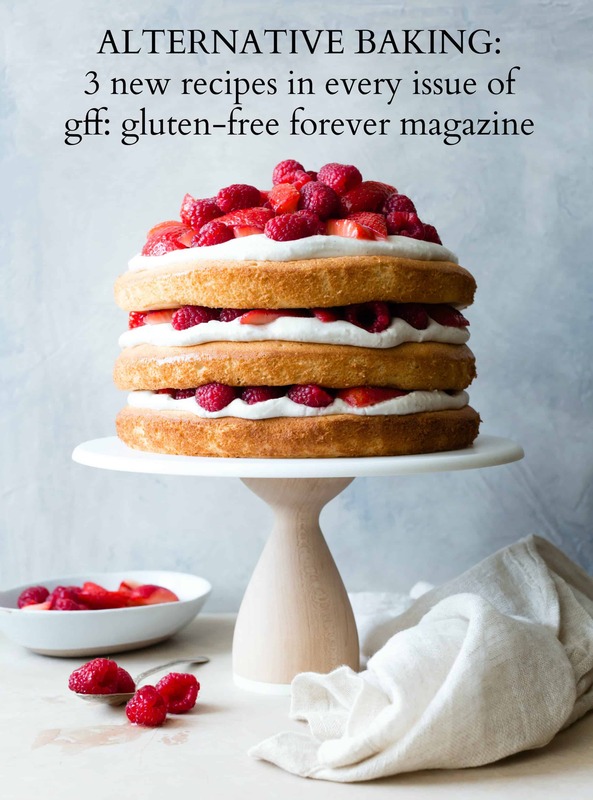 If gluten is a non-issue, feel free to trade the flours in the crust and frangipane for white or whole wheat flours. Position a rack in the center of the oven and preheat to 350º. Have a rimmed baking sheet and 4.25 x 14.5-inch rectangular tart pan (or an 8-inch round pan) with removable bottom ready. 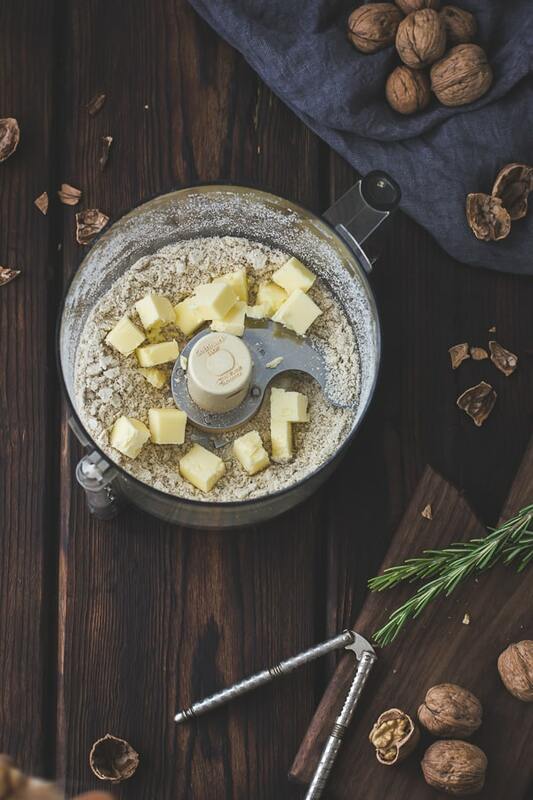 In the bowl of a food processor, combine the walnuts, oat, rice and sorghum flours, with the sugar, and salt. Process until the walnuts are finely ground. Add the butter and pulse until the mixture begins to clump together, about 30-60 seconds. If it doesn’t come together, keep processing until it does. Dump the crumbly dough into the tart pan. Use your fingers to press the crumbs first into the sides then into the bottoms of each pan to about a 1/8″ thickness, taking the time to make it as even as you have the patience for. If the dough becomes sticky, chill for a few minutes and dust your fingers lightly with flour. Lightly prick the bottom of the tart with the tines of a fork in a few places. Freeze until firm, 15 minutes. 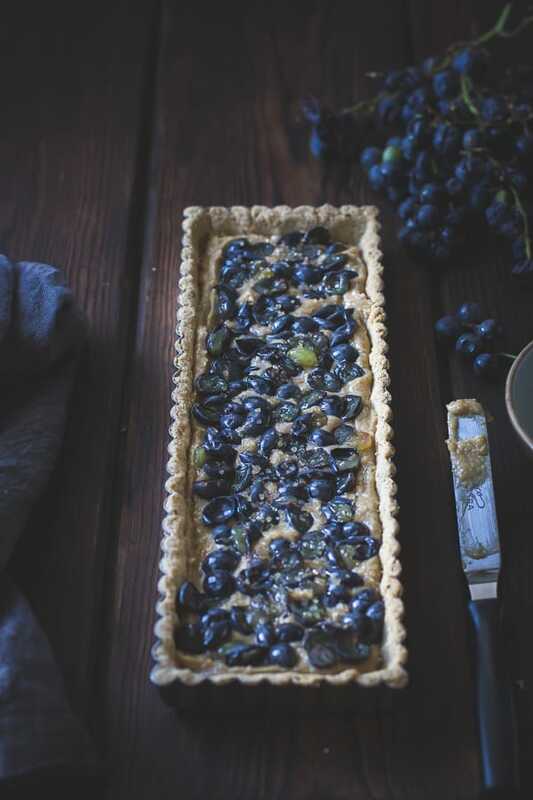 Place the tart shell on the rimmed baking sheet, and put in the oven (no need for weights). Bake until golden and firm, 18-22 minutes. 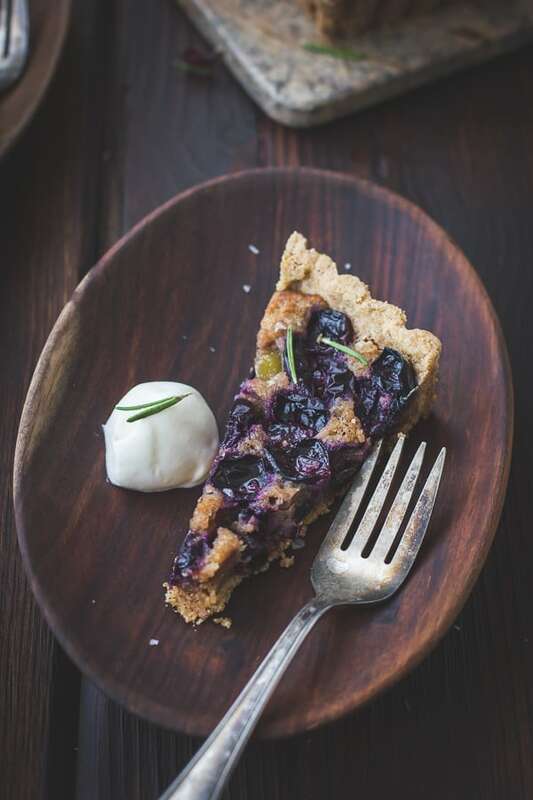 While the crust is still hot, use the back of a teaspoon to press the sides and bottom down gently; this compresses the crust and makes it less prone to crumbling. 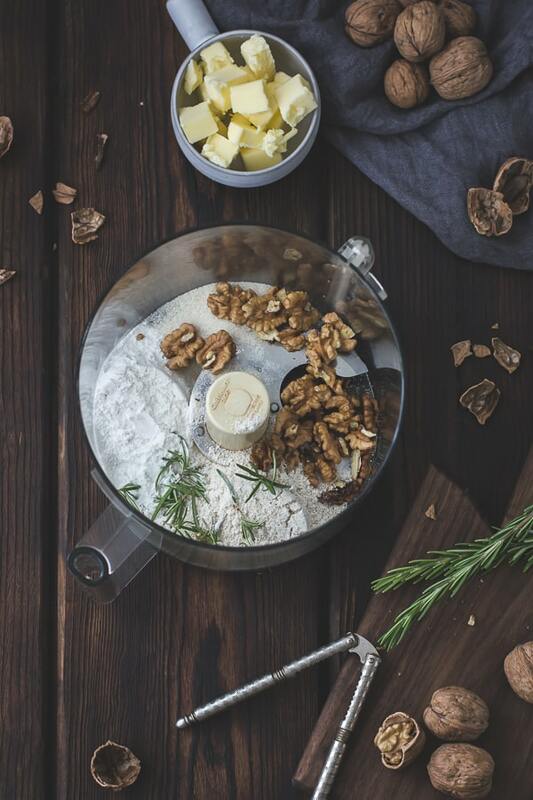 Place the walnuts, 1/4 cup of sugar, flour and salt in the bowl of a food processor and grind very fine. Add the butter and egg and process until smooth. Scrape the frangipane into the par-baked tart shell and spread into an even layer. 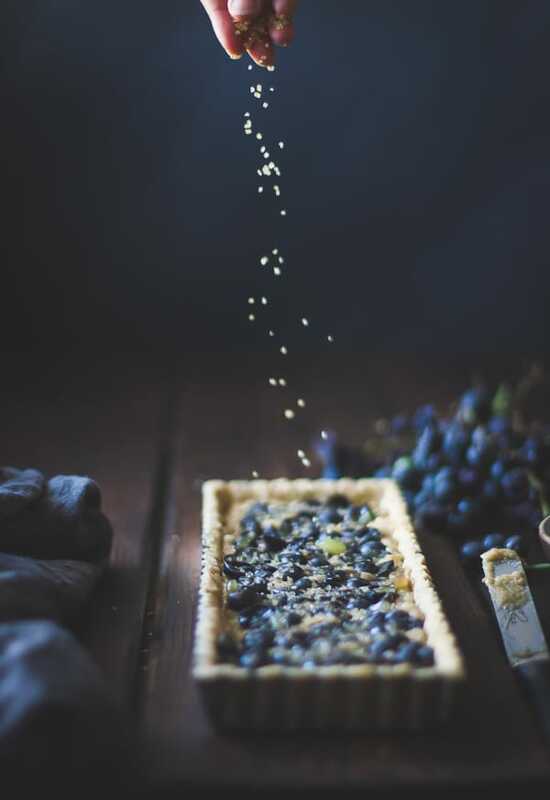 Sprinkle the grapes on top of the frangipane and press down slightly. Sprinkle with the coarse sugar. Bake the tart until the frangipane is puffed, golden, and firm to the touch, about 35-45 minutes, rotating the tart halfway through the baking time. Let the tart cool for at least 20 minutes. To remove the sides, place the tart on a few small jars, ease the pan sides away from the crust, and let it slip down. Cut the tart into wedges, and serve warm or at room temperature with a dollop of the whipped crème fraîche. This looks so delicious! 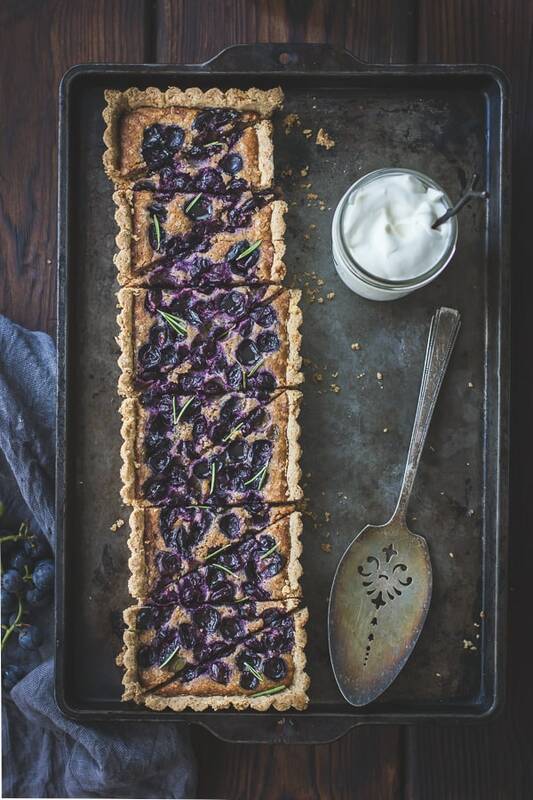 I love the combo of the grapes, the tart, the rosemary. I'm glad to know it was worth the extra effort of seeding the grapes! Thanks, Karishma! I wanted to make sure it was really necessary first. :) Though someone just told me they found seedless concord grapes – hurray! Love these photos. Especially the kitty photo-bomb at the end! And your writing made me laugh, although I'm sorry you had to seed all those grapes! Concord grapes! I'm doing a happy dance whenever I spot some. They really are that fantastic. 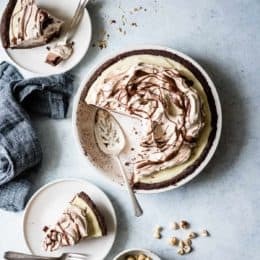 This tart looks luscious and totally worth the extra minutes in the kitchen + those bloody old memories. P.S. 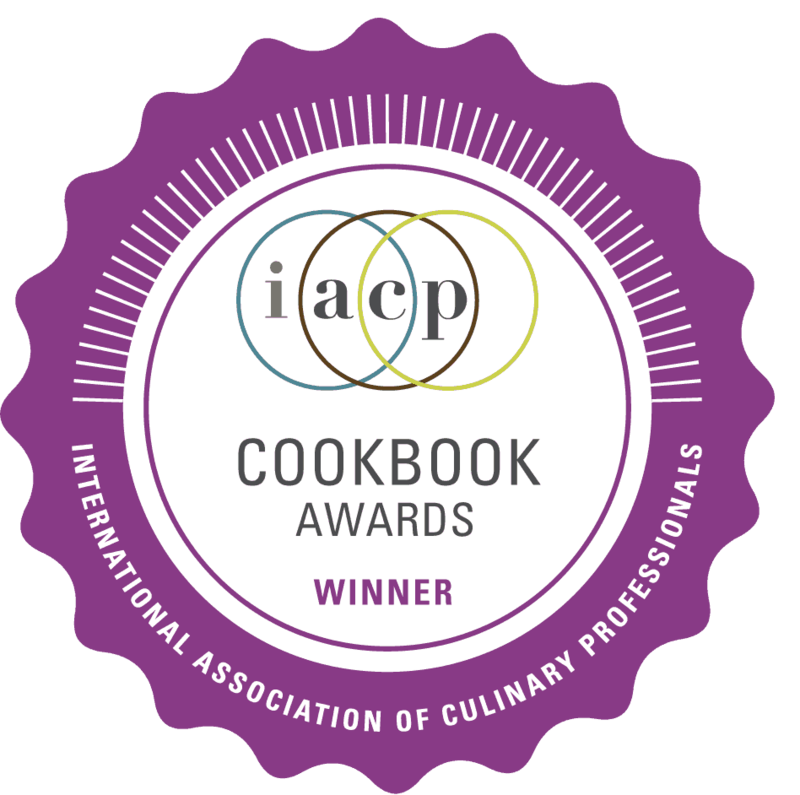 LOVE your friend Danese's cookbook idea! P.P.S. KITTY!! Ha! Thank you so much Sini! I haven't ever baked with grapes before, so this is definitely intriguing. Lovely crust too! Thanks, Katrina! They work surprisingly well! The tart looks like it was worth the effort with the grapes – at least it made a great story (and made me smile)! I can't believe how purple those grapes stayed even after baking. So many fruits lose their color in baking. This looks just LOVELY. Your friend's kitchen mantra is the sweetest thing! Also, what a lovely idea she has to make a cookbook for her friends and family. 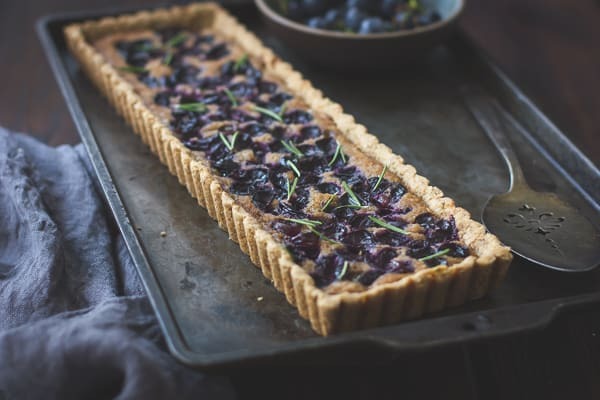 Your tart with frangipane and rosemary has me salivating over here – I HAVE to make this! Gorgeous! What?! That just made my day! I didn't know seedless concords existed – hurray! Also it apparently leads me to write bad poetry. :) I think that flour combo should work perfectly. If the dough doesn't come together after 30 seconds, just add another tablespoon of butter. I posted a gluten-full version here if you want to compare the two recipes, too: https://www.bojongourmet.com/2013/05/rhubarb-bourbon-brown-butter-tart-with.html. Come back and let me know how it goes! Thank you for that crust recipe! I can see that being very versatile–lots of possibilities, don't you think? Very much so! 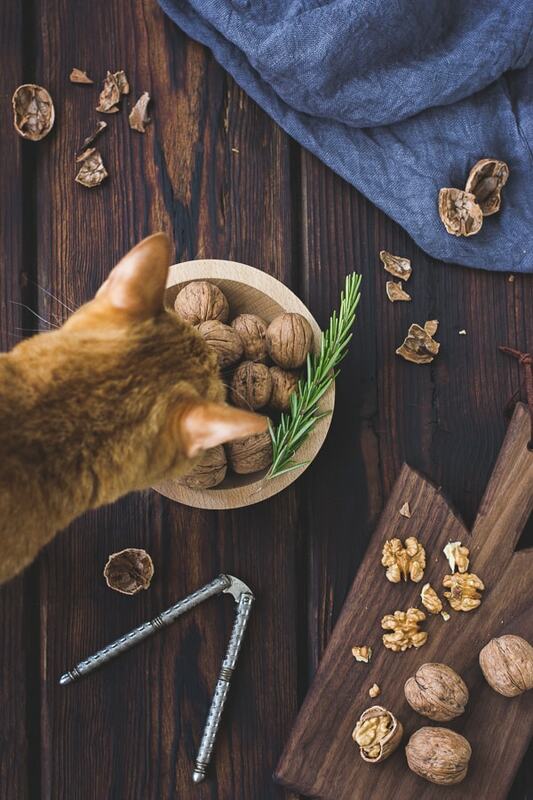 You could use any nut, and swap the rosemary for other flavors. Please let me know if you make it! 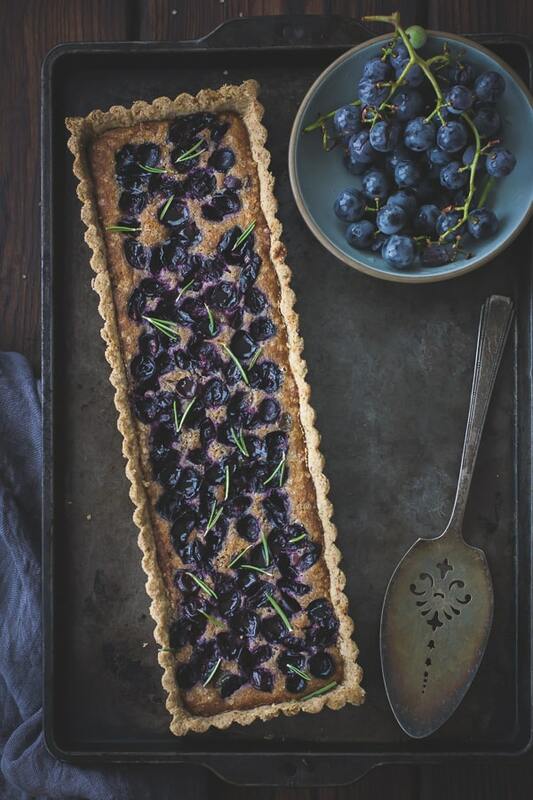 'I love this tart, I love think tart, I love this tart…'"
This tart is so beautiful! I love Concord grapes. They taste how grapes should taste in your mind but almost never do. So worth the pitting. I completely agree! I've had so many this year but each one I pop in my mouth still blows me away. You make the prettiest tarts! I'm smitten with the grapes and rosemary pairing! Aw, thank you Laura! The two go really nicely together, don't they? Gorgeous frangipane, but even more beautiful words. Reading about the "I love you" mantra and your own concord grape hell brought a smile to my face on a morning that has been far from pleasing. If that's not the true intent of blogging, I don't know what is. What a kind thing to say – thank you Ksenia. I'm sorry you've had a rough morning and I hope that the day has improved! 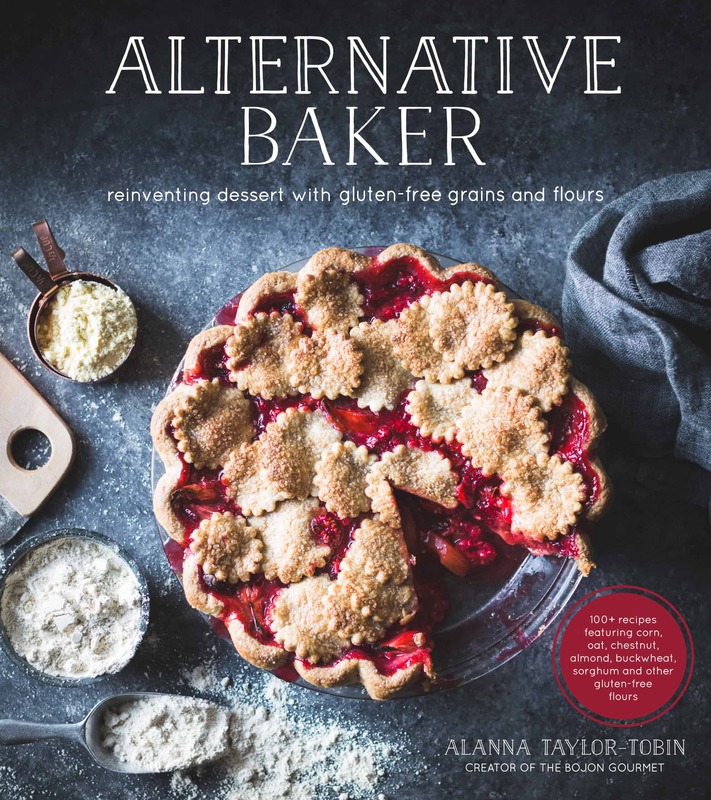 You are a true artist — this is spectacular, and I just love the combination of frangipane with all kinds of fruit. One of the farmer's at our Sunday market sells seedless Concords, but you know, the flavor isn't there. You can't mess with Mother Nature, she knows what she's doing! Fabulous post! You sweetheart! Thank you, Sue. Ok, I'm glad to know the seedless Concords aren't all that – now I don't feel so bad for writing this ranty post. I love your story. Sometimes I think it'd be fun to work in a restaurant… And I obviously have no idea of what it would be like. Thanks for reminding me what a gift (so cheesy a way to put it, but it's true) being able to have an "I love you" mantra is. Also, the flavors! The photos! Ahhhh. You're the best. xo. Alanna, this is incredibly beautiful and I love the story you shared along with it. The fantasy of working in a restaurant kitchen is definitely more beautiful than the reality (I never worked in the kitchen but I worked in restaurants for years and saw how hard the kitchen worked). And the photos of this tart are GORGEOUS!! Incredible. Too right about the reality of restaurant work – ugh. Thank you so much for the kind words, Alana!! Obsessed with how beautiful this is, it sounds amazing. I just tried making concord grape jam and that was the first time I really ever had them not inside a Smuckers jar… AMAZING. Yum! I bet that was spectacular. Thank you for the kind words! 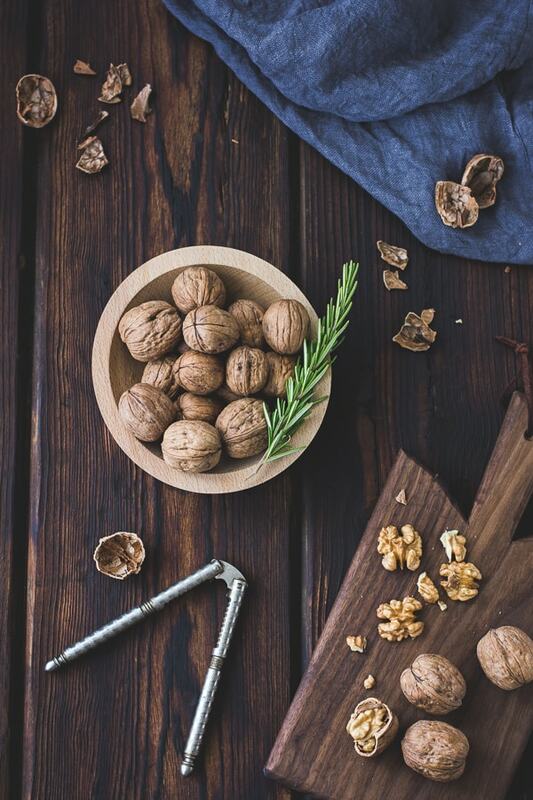 with adaptations in mind, if i were going to sub in hazelnuts for the walnuts, do you think i could just throw them in raw, skin and all? or should i toast/remove the skins. Crossing fingers for Concords! I think you could go either way with the hazelnuts, toasting them if you want a more pronounced flavor and leaving them raw for more subtlety and a faint touch of bitterness from the skins. Please let me know what you try, and thank you so much for the kind words! 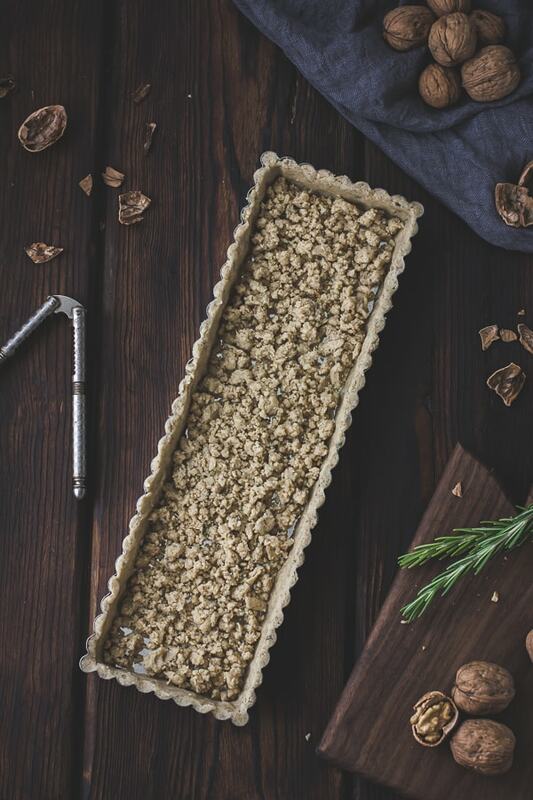 they never did turn up so i went with seckel pears and used the whole raw hazelnuts – that rosemary crust calls to me when it's not around! incredibly good. i've made it twice, so: thank you thank you! Ooooooh!!! That version sounds completely amazing! I just saw some seckel pears, and now I'm dying to try your variation. Thank you so much for the note! So lovely cake! I'm sure it's delicious! Your photos amazing, as always=) Love all your works! No idea, but please let me know how it goes! I have had this recipe pinned forever and I just tried it tonight. It was AMAZING! I used apricots because they are in season here in GA and it was SO good. You would never know the crust is gluten free. I can’t wait to try different nut/fruit combos. Thank you so much for sharing. I already know this will be a regular item on my menu. 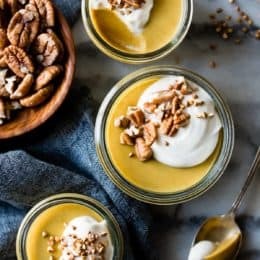 I loooooove this recipe and it has been a big hit thus far. I plan to make it one day ahead of serving this time though…is it ok to leave out room temperature for a day or so if carefully sealed? Would refrigerating/freezing ruin the texture? Hi Maria! Apologies for the delay. I just tried leaving a different tart with a similar crust out at room temp for a day and the crust got quite soft. I think refrigerating it should be the best bet and keep the crust as crisp as possible. Maybe let it come to room temp for an hour or so before serving? Please let me know how it goes!